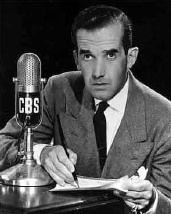 Just watched George Clooney’s Good Night, and Good Luck again – a slow, absorbing and intelligent film on Edward R Murrow, an American broadcast journalist who was highly-regarded and respected. The movie focused on a series of TV news reports that helped lead to the censure of Senator Joseph McCarthy. I have no technical advice or counsel to offer those of you who labor in this vineyard that produces words and pictures. You will forgive me for not telling you that instruments with which you work are miraculous, that your responsibility is unprecedented or that your aspirations are frequently frustrated. It is not necessary to remind you that the fact that your voice is amplified to the degree where it reaches from one end of the country to the other does not confer upon you greater wisdom or understanding than you possessed when your voice reached only from one end of the bar to the other. All of these things you know…. I invite your attention to the television schedules of all networks between the hours of 8 and 11 p.m., Eastern Time. Here you will find only fleeting and spasmodic reference to the fact that this nation is in mortal danger. There are, it is true, occasional informative programs presented in that intellectual ghetto on Sunday afternoons. But during the daily peak viewing periods, television in the main insulates us from the realities of the world in which we live. If this state of affairs continues, we may alter an advertising slogan to read: LOOK NOW, PAY LATER. For surely we shall pay for using this most powerful instrument of communication to insulate the citizenry from the hard and demanding realities which must be faced if we are to survive. I mean the word survive literally. If there were to be a competition in indifference, or perhaps in insulation from reality, then Nero and his fiddle, Chamberlain and his umbrella, could not find a place on an early afternoon sustaining show. If Hollywood were to run out of Indians, the program schedules would be mangled beyond all recognition. Then some courageous soul with a small budget might be able to do a documentary telling what, in fact, we have done–and are still doing–to the Indians in this country. But that would be unpleasant. And we must at all costs shield the sensitive citizens from anything that is unpleasant. I am entirely persuaded that the American public is more reasonable, restrained and more mature than most of our industry’s program planners believe. Their fear of controversy is not warranted by the evidence. I have reason to know, as do many of you, that when the evidence on a controversial subject is fairly and calmly presented, the public recognizes it for what it is–an effort to illuminate rather than to agitate…. This instrument can teach, it can illuminate; yes, and it can even inspire. But it can do so only to the extent that humans are determined to use it to those ends. Otherwise it is merely wires and lights in a box. There is a great and perhaps decisive battle to be fought against ignorance, intolerance and indifference. This weapon of television could be useful. Stonewall Jackson, who knew something about the use of weapons, is reported to have said, “When war comes, you must draw the sword and throw away the scabbard.” The trouble with television is that it is rusting in the scabbard during a battle for survival.